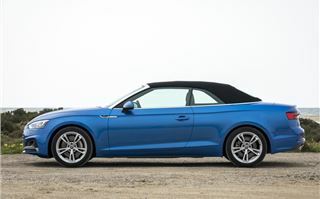 It's fair to say the new Audi A5 Cabriolet plays it safe. A neat evolution of the car it replaces, it’s a bit like the Antiques Roadshow of convertibles - reassuring but hardly groundbreaking. And with less Fiona Bruce. It’s not exactly daring (the A5, not Fiona Bruce) but then neither was the old one - and that proved a big success. 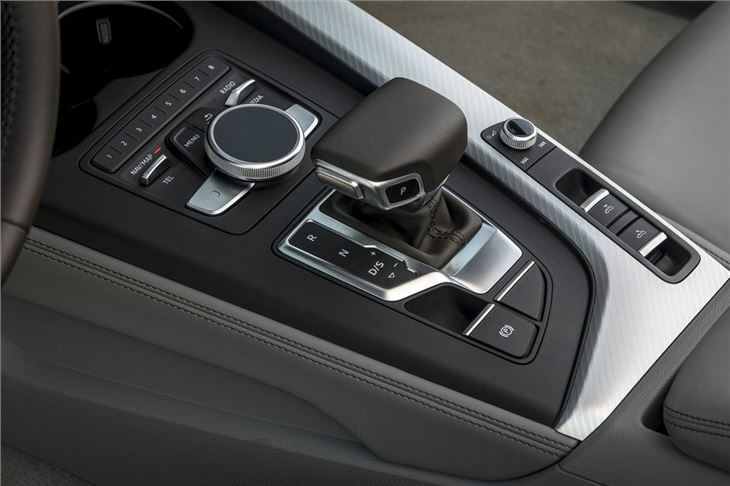 What has changed - and for the better - is the interior, although given that the outgoing model is now nine years old, that’s hardly a surprise. It’s well finished and there’s a stylish flow to the design. Yes, this is what we’ve come to expect from premium cars at this price, but nonetheless Audi does it very well with modern touches and an intuitive layout. 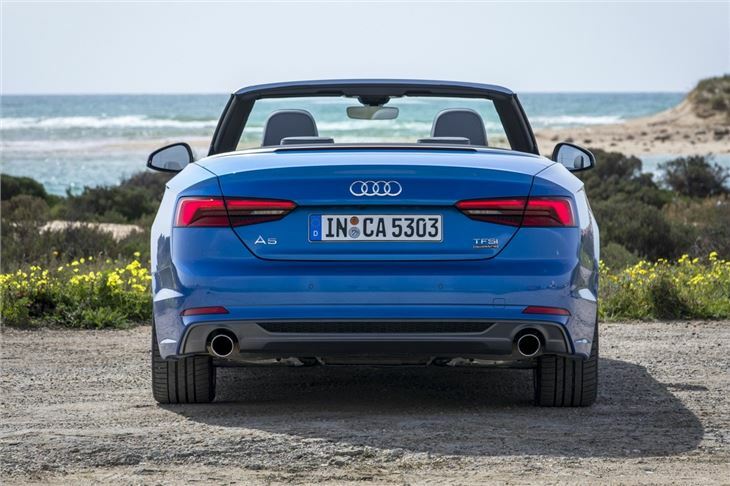 All A5 Cabriolet models get the Audi MMI system which is easy to use and, if you go for a Sport model or above, it gets navigation too. 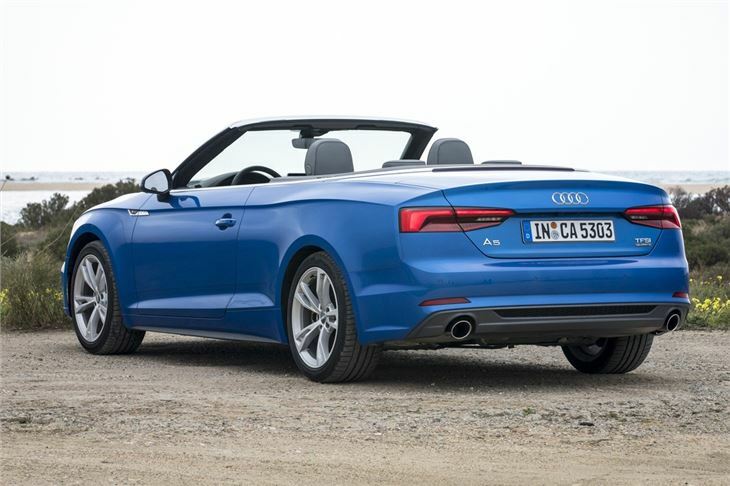 Audi has worked to make this A5 Cabriolet more comfortable than the old model. So it gets a new acoustic hood with extra insulation that reduces noise and keeps out the cold too. In fact, with the roof up, it’s barely any noisier than the coupe. You can now also drop the roof with one touch, so you no longer have to keep your finger on the button. First world problems and all that. The roof folds down as smoothly and quietly as you’d expect – it’s not as if this is Audi’s first ever convertible so you’d hope they’d have cracked it by now – and you can operate it on the move too, up to 30mph. You can drop it like it’s hot in 18 seconds, sunburnt bald patch here we come, plus there’s the usual ugly wind deflector that can go across the back seats to keep your barnet in place. So what about the drive? Well as there’s no fixed roof, Audi has made the body stiffer – by 40 percent compared to the coupe if you’re counting – to compensate. The result is pretty much zero body flexing in corners. It drives much like the coupe with very little in the way of body roll and plenty of grip. The fact this is a quattro helps of course, meaning better traction, for example when pulling out of a junction onto a fast A road. The flipside of this rigid body coin is the ride. It’s notably firmer than the coupe although far from uncomfortable. That said, we were driving an S line model which has 20mm lowered suspension and larger alloy wheels. Even so, if you do have to traverse a potholed surface – or as we call them in the UK ‘roads’ – there are no squeaks or rattles from the roof. 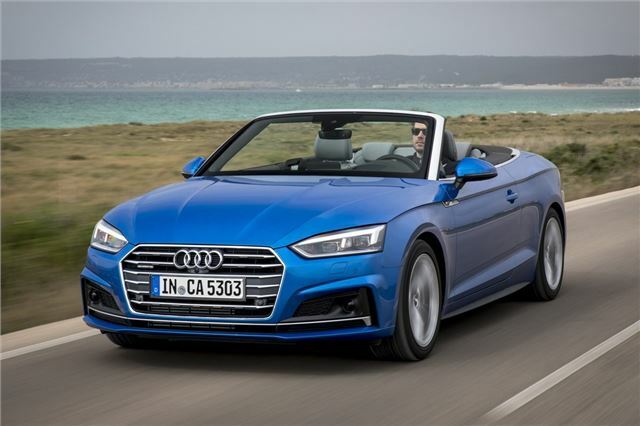 As you’d expect, you get the same engines as the A5 Coupe, with the 2.0 TDI the best choice if you want decent economy – Audi claims more than 60mpg. However, drop the roof down and the noise of that four-cylinder diesel is unlikely to get you particularly moist (can we say that..?). 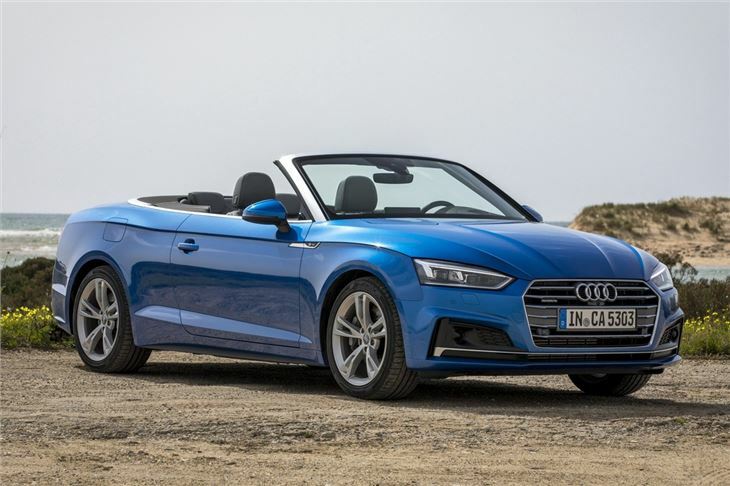 If you’re actually buying the A5 Cabriolet to drive with the roof down – shocker – then the 2.0 TFSI is much nicer for your ears. It’s also the cheapest model – at £35k – and has the same 190PS power output as the 2.0 TDI. 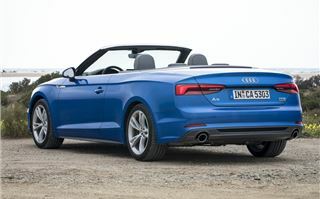 However, if you want the quattro version this only comes with a more powerful 252PS version of the TFSI engine. And the cost goes up as you’d expect. In fact, you’re looking at a list price of £44,000. Ouch. Still, it does come with the seven-speed S tronic automatic as standard. The 2.0-litre TFSI is used across the Volkswagen collective in everything from the new Skoda Kodiaq to the Volkswagen Golf GTI. The fact it’s turbocharged means plenty of low down power, with 370Nm of torque so you don’t need to rev the socks off it. Around town it’s quiet and a lot more pleasant than the diesel. Get onto an open road and the chance to put your foot down and it really comes alive. It’s an enjoyable engine to drive and makes quite a nice noise too, in a buzzy and sporty sort of manner. 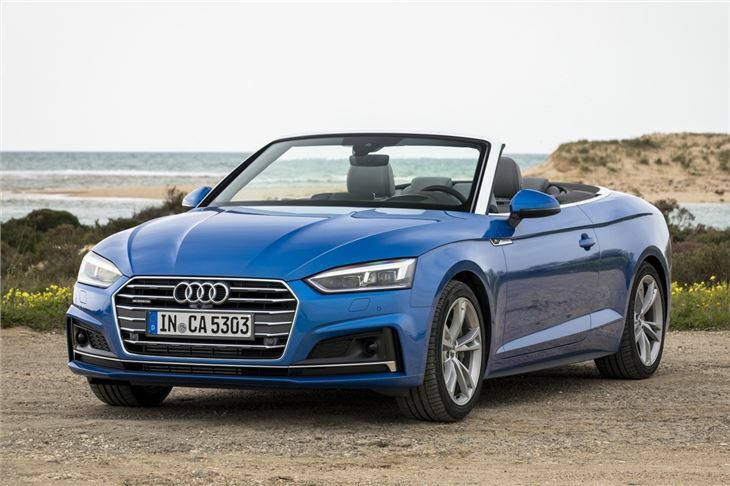 While the S tronic automatic isn’t that well suited to the 2.0 TDI engine, it’s much more impressive with this TFSI, with less hesitation and more immediate power when you want it. The fly in this petrol-powered ointment is fuel economy. 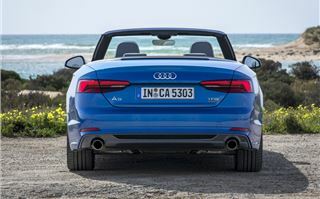 Official figures rate this A5 2.0 TFSI at 44.8mpg (on 17-inch wheels), which is some way behind the diesel which has a claimed figure of more 60mpg. But owners of the A4 with the same engine are seeing less than 28mpg in Real MPG. Even if you’re not doing many miles each year, that’s still pretty poor. 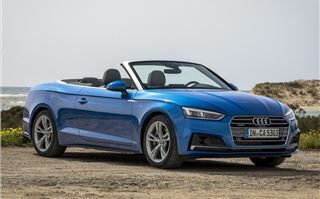 So while the more powerful 2.0 TFSI is an impressive bit of kit, it’s hard to justify the extra cost over the standard 190PS model, which will provide more than enough performance for most, despite the lack of four-wheel drive. What doesn’t change is the high levels of standard kit. Go for a Sport – which we think is the best value – and you get leather upholstery, MMI navigation, electric seats and parking sensors front and rear.